Reminiscent of a Victorian farmhouse, this bed and breakfast is surrounded by sixteen forested acres of maple and birch trees. This Select Registry, Diamond Collection and AAA 4-Diamond property is located in Barnard, Vermont a quaint village on lovely Silver Lake – not far from Woodstock, Vermont. 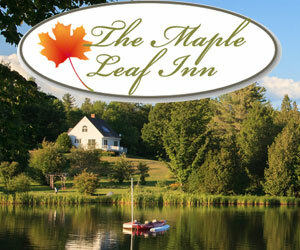 Maple Leaf Inn is a wonderful alternative to lodging in Woodstock, and other nearby Vermont hotels. The inn is conveniently located near the Vermont Law School, Dartmouth College, Simon Pearce, and King Arthur Flour. Maple Leaf Inn is ideal whether you’re looking for a romantic getaway, an outdoor adventure, or to simply relax and recharge. Electric vehicle drivers will be happy to know the inn has two electric car charging stations! A highly recommended Woodstock Vermont area Inn. Ask us about Woodstock – Quechee VT Inn lodging. If you would like to add your Woodstock Vermont Country Inn, Lodge or Bed Breakfast Inn to this web site, please contact us.